To Cite: Rahmati M, Taherabadi S J, Mehrabi M. Decreased Activity in Neuropathic Pain Form and Gene Expression of Cyclin-Dependent Kinase5 and Glycogen Synthase Kinase-3 Beta in Soleus Muscle of Wistar Male Rats, Iran Red Crescent Med J. 2015 ; 17(6):e23324. doi: 10.5812/ircmj.23324. Background: The relationship between decreased activity/neuropathic pain and gene expression alterations in soleus muscle has remained elusive. Objectives: In this experimental study, we investigated the effects of decreased activity in neuropathic pain form on Cyclin-Dependent Kinase 5 (CDK5) and Glycogen Synthase Kinase-3 β (GSK-3β) gene expression in soleus muscle of rats. Materials and Methods: Twelve male Wistar rats were randomly divided into three groups: (1) tight ligation of the L5 spinal nerve (SNL: n = 4); (2) sham surgery (Sham: n = 4), and (3) control (C: n = 4). The threshold to produce a withdrawal response to a mechanical and thermal stimulus was measured using von Frey filaments and radiation heat apparatus, respectively. 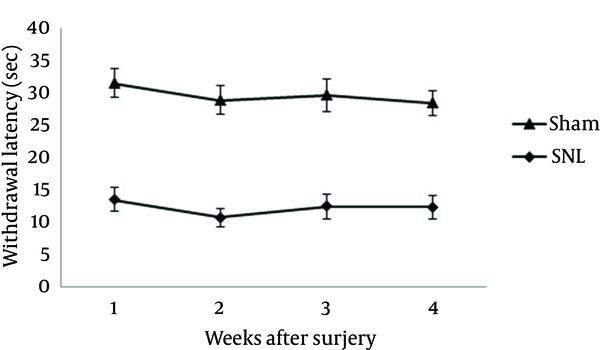 Following 4 weeks after surgery, the left soleus muscle was removed and mRNA levels were determined by real-time Polymerase Chain Reaction (PCR). Results: Compared to control animals, L5 ligated animals developed mechanical and heat hypersensitivity during total period of study. Soleus muscle weight as well as CDK5 mRNA levels (less than ~ 0.4 fold) was decreased and GSK-3β mRNA levels (up to ~ 7 folds) increased in L5 ligated animals. Conclusions: These results showed enhanced muscle atrophy processes following peripheral nerve damage and might provide a useful approach to study underlying muscle mechanisms associated with clinical neuropathic pain syndromes. Neuropathic pain is a chronic pain defined as a pain caused by damages to or dysfunction of somatosensory system and can expresses itself in the following forms: allodynia, hyperalgesia, and spontaneous pain (1). Along with causing changes to nervous system, neuropathic pain can decrease physical activity levels (2, 3). Furthermore, neuropathic pain can affect structure and function of muscles through muscular atrophy (4, 5). Many studies have proven that models of neuropathic pains will be followed with muscle atrophy (5-8). However, exact cellular mechanisms, which cause changes after nervous damages are still unknown (8). Cyclin-Dependent Kinases (Cdks) are serine/threonine protein kinases that play key roles in the regulation of cell cycle, initiation of transcription, and control of certain metabolic cascades in mammalian cells (9, 10). Cdks activity has a vital role in different functions of nerve cells such as neuronal growth and migration, cell secretion, dopamine signaling, and cytoskeletal dynamics (10). Glycogen Synthase Kinase-3 (GSK3) is also a serine/threonine kinase that exists in two isoforms of alpha and beta (11) and participate in the modulation of various functions such as cell signaling, growth metabolism, and many other transcriptional regulating survival and death factors in organisms (12). In general, Cdk5 and GSK-3β are two of the most important protein kinases involved in neuropathic pain signaling (13, 14). Furthermore, the role of these two proteins in the regulation of muscle plasticity has been clearly proved. For example, it has been shown that GSK-3β is necessary in myofibrillar protein loss system and its reduction causes preserving of contractile protein against proteolysis (15). Cdk5 also has a key role in skeletal muscle’s structure and its function so that it is effective in changing muscle phonotype and essentially these changes come from its effects on cytoskeleton proteins’ structure such as actin and microtubules and regulation of myogenesis (16, 17). On the other hand, changes to expression of Cdk5 and GSK-3β in muscular and nervous systems after numerous interferences infer such an insight that related systems change through following conditions: chronic state of motor unit activity, afferent activity level toward motor neurons, number of innervated muscle fibers by motor neurons, and metabolic level of target tissue. We set the goal of this study on considering the effects of decreased activity in the form of neuropathic pain caused by ligation of the L5 spinal nerve on CDK5 and GSK-3β gene expression in soleus muscle of Wistar male rats. Animals were anesthetized by pentobarbital sodium (60 mg/kg, intraperitoneal). Then, L5 spinal nerve was tightly ligated according to the method of Kim and Chung (1992) (18). Briefly, the left paraspinal muscles were separated at L5-S2 level and the left transverse process of L6 vertebra was removed. The left L5 spinal nerve was identified and gently separated from adjacent L4 spinal nerve. Then, L5 spinal nerve was tightly ligated using silk threads (6/0) and was transected just distal to ligature to ensure that all fibers were interrupted. Next, the wound was closed with silk threads (3/0). Great care was taken to avoid any damages to L4 nerve. In the control sham group, the surgical procedure was identical to that described above, except for the left L5 spinal nerve that was not ligated and transected. Only animals showing no signs of motor deficiencies were considered to be used for further experimentations, those animals without neuropathic pains in their behavioral tests. Then the rats were divided in 3 groups with 5 members in each: non-operated, sham, and neuropathic pain (SNL) groups. After 4 weeks, rats were anesthetized by injecting intraperitoneal ketamine (90 mL/kg) and xylazine (10 mL/kg) and the muscle tissue samples were separated from the left soleus muscle and situated in -80°C nitrogen for future analysis. Radiation heat apparatus was used to measure hyperalgesia in which the middle part of animal’s paw from Plexiglas level was exposed to thermal constant radiations and paw withdraw threshold time (PWTs) was calculated. Heat excitations repeated 3 times, with 5 to 10 minutes intervals. To measure the mechanical allodynia, animal was located on the wired network and inside the Plexiglas capsule with 20 × 20 × 30 cm dimensions. After acclimatization with new environment, von Frey fibers with weight range of 2 to 60 g (2, 4, 6, 8, 15, 26, and 60 g) (manufactured by Stolting Inc.) were used. The experiment started with the lightest fiber and in the non-response cases, heavier fibers were gradually employed. For excitation initiation, each fiber was inserted into animal’s paw in 3 consecutive times for 1 s with 5 s intervals. If we had positive response (animal raising its foot) in 2 consecutive performances, that weight of fiber would have been selected as the response threshold. If animal had no response to all of the fibers, number 60 would have been considered as the response threshold (19). Soleus muscles from the left leg were quantitatively dissected from the bone, immediately weighed, and frozen at 20°C. Later, these muscles were lyophilized and weighed for their dry weight. After excision of muscles, the left tibia was removed and freed from connective tissue, and the maximal length was measured. Yin et al. (20) showed that expressing muscle mass per unit of tibial length is a valid way to normalize mass when body weight differs between experimental groups. RNA extraction was done by QlAzol® Lysis Reagent (Germany, Qiagen) and chloroform (Germany, Qiagen) according to manufacturer’s instructions. So, about 50 mg of the muscle tissue was separately homogenized in 1 to 10 portions in QlAzol® Lysis Reagent for total RNA extraction and removing protein components. The final product was centrifuged at 12000 ×g for 10 minutes at 4°C. Then, it mixed with chloroform in 1 to 5 portions and was shaken severely for 15 s. Then the supernatant was centrifuged at 12000 ×g for 10 minutes at 4°C and its water and mineral part were removed. Finally, its RNA contained portion was removed and mixed with isopropanol in 1 to 5 portions. It was left for 10 minutes at room temperature and then centrifuged at 12000 ×g at 4°C for 10 minutes. RNA contained Pellet was washed and resolved in 20 µL RNsa-free water. RNA concentration was measured by UV spectrophotometry method (Eppendorf, Germany), and 260 to 280 portions in 1.8 - 2 were determined as the desired purification. cDNA synthesis was done by using Quanti Tect Reverse Transcription Kit (Qiagen, Germany) in accordance to the manufacturer’s manual. Real-Time PCR quantity method was used by Premix SYBR Green II (Qiagen, Germany) for measuring CDK5 and GSK-3β mRNA expression levels (Applied Biosystems StepOne, America). Reaction mixture was done in final volume in 20 µL (includes 1 µL of cDNA, 1 µL of forward primer, 1 µL of reverse primer, 7 µL of DEPC water and 10 µL of Syber Green) and each reaction in duplicate. Designing of primers was done according to CDK5, GSK-3β and GAPDH genes in gene bank of NCBI and by German company, Qiagen. Usable primer sequences have been reported in Table 1. Furthermore, GAPDH was used as the reference gene. Thermal program used in Real Time-PCR included: 95°C for 10 minutes, 95°C for 15 s, 60°C for 1 min (40 cycle repetitions). Melt curve and standard curve were drawn and considered for evaluating data authenticity and optimization experiment conditions, respectively and CDK5 and GSK-3β expression data were normalized using GAPDH (reference gene). Fold change of genes was measured by Equation 2 (21). a Abbreviations: For, forward; CDK5, Cyclin-dependent kinase 5; GAPDH, Glyceraldehyde-3-phosphate dehydrogenase; GSK-3β, Glycogen synthase kinase-3β; Rev, Reverse. All statistical analyses were done by using SPSS software (version 19, SPSS Inc., Chicago, IL, USA). Normal assumption was examined using 1-sample Kolmogorov-Smirnov test. One-way repeated measures ANOVA and Independent t tests were used to compare groups regarding under study variables and followed by Tukey HSD post hoc. Significant level was determined at P ≥ 0.05. All rats that received L5 SNL developed mechanical and heat hypersensitivity on the ipsilateral hind paw. As shown in Figure 1 and 2, PWT as well as PWL in the SNL group were lower postoperatively on the first, second, third and fourth weeks (P < 0.05 versus sham group), indicating that mechanical allodynia and thermal hyperalgesia has been induced by SNL operation. 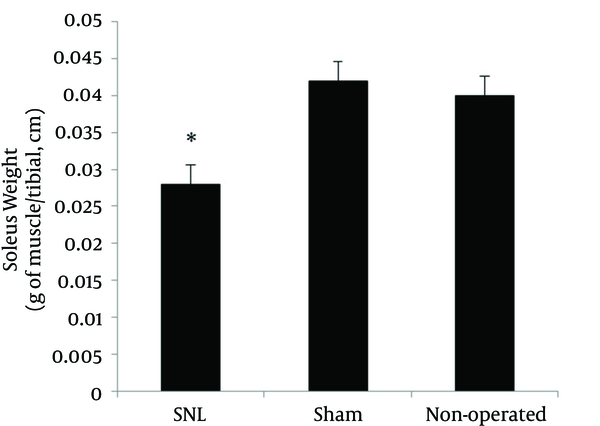 PWT decreased in the SNL rats postoperatively on the first, second, third and fourth weeks (P < 0.05 versus sham group). Data are presented as the mean ± SD. PWT decreased in the SNL rats postoperatively on the first, second, third, and fourth weeks (P < 0.05 versus sham group). Data are presented as the mean ± SD. 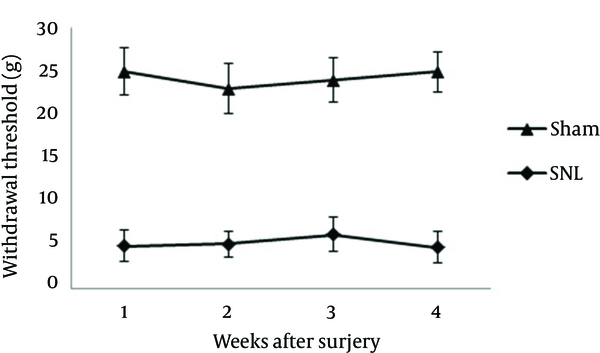 Muscle mass was reduced in SNL rats. Data are presented as mean ± SD, which indicate significant differences with other groups (P < 0.05). For the GAPDH (186 bp), CDK5 (210 bp), and GSK-3β (206 bp) genes, M = 100-bp DNA Ladder. Data are presented as mean ± SD, which indicate significant differences with other groups (P < 0.05). Weight of the soleus muscle decreased in SNL rats and this result indicates muscular atrophy as a consequence of tight ligation of the L5 spinal nerve (Figure 3). To elucidate the possible regulation of CDK5 and GSK-3β at mRNA level in rat models with neuropathic pain, we examined CDK5 and GSK-3β at mRNA level in soleus muscle after 4 weeks of tight ligation of L5 spinal nerves. 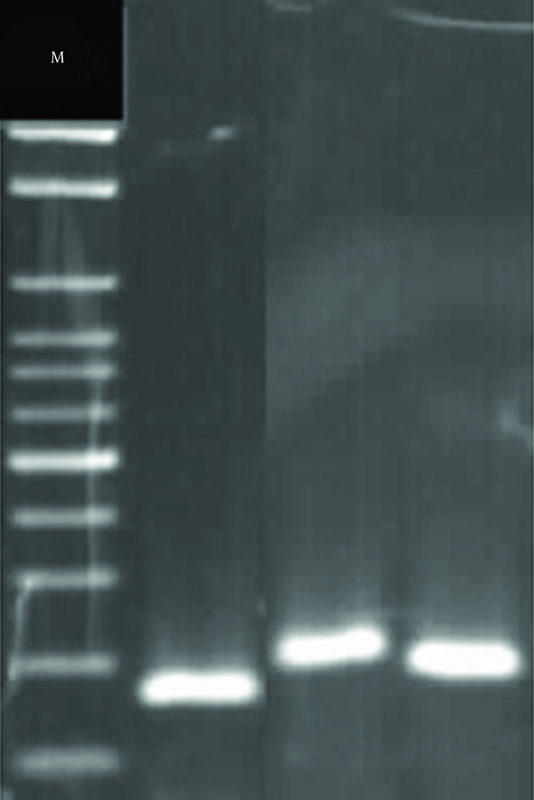 Agarose gel electrophoresis presented a single band with the expected size (Figure 4) and as indicated in Figure 5 and 6CDK5 mRNA levels were down regulated and GSK-3β mRNA levels were up regulated. Candidate gene selection followed by decreased activity in neuropathic pain form studies is greatly influenced by the current knowledge of the pathogenic mechanisms involved in this disease. In the present study, it was observed that decreased activity in form of tight ligation of the L5 spinal nerve causes decreased CDK5 mRNA gene expression in soleus muscle, while amount of GSK-3β mRNA gene expression increases. Moreover, we show that tight ligation of the L5 spinal nerve causes soleus muscle atrophy that could be attributed to this changes. Intracellular signaling cascades, which result in immediate early gene induction and maintenance, can control widespread changes in gene and protein expression. These changes lead to changes in muscle plasticity. Careful study in the relationship of different gene regulations is important for further understanding of pathogenesis of neuropathic pain. Previous studies showed that neuropathic pain increased Cdk5 protein (22) and decreased GSK-3β protein (23). However, they did not show whether this increase in Cdk5 protein levels and decrease in GSK-3β protein levels are due to the changes in their mRNA or degradation. The present data led us to conclude that down regulation of CDK5 and up regulation of GSK-3β may cause decrease and increase in their protein level, respectively, a conclusion that previously reported by others. Neuropathic pain is related to decrease and disorders in physical activities. Such decreases in the activity cause inability in physical fitness, increase in blood pressure, and decrease in musculoskeletal functions. Improper physical activity leads to structural and functional reduction of skeletal muscle (24). Besides, damages to motor neurons lead to many morphological and biochemical changes in muscles (25, 26). Spinal cord injury is related to atrophy and decrease in the size of muscle mass, which pathologists related it to nerve damages and decrease in activity and movement because of pain existence (27). Decreased activity because of hyperalgesia and allodynia increases proteolysis and decreases protein synthesis in muscles (28). Furthermore, existing evidence shows that tight ligation of the L5 spinal nerve causes limitation but not complete inhibition of muscle electrical activity. Greensmith et al. (1997) (29) showed that by exciting motor neurons of L4 segment, only 30% of maximum generated force of soleus muscle was recruited; however, by exciting motor neuron of L5 segment, 70% of maximum generated force of the muscle was recruited. Denervation causes effective intracellular environment changes, decrease in muscle mass, number and volume of mitochondria, and increase in apoptosis proteins (30). Cdk5 activity and its receptor (p35) in afferent neurons are very important in understanding the reason for its acute pain (14). In muscles, CDK5 expression is very necessary in its natural amount and unnatural CDK5 expression in non-nervous cells. Both expressions are done mainly through its direct or indirect effects on organizing cytoskeleton structures such as actin and microtubules, which seems to cause such structure changes and these changes on cytoskeleton structure leads to cellular disorders and disease (16). Fu et al. (2002) (26) reported CDK5 expression in skeletal muscles of rats after nervous damages showed an unnatural increase, which followed by increase in acetilcoline receptors in neuromuscular junction. Such increase may have been due to inhibition of motor nerves electrical activity. Differences in the findings of the present study to that of Fu and his colleagues can be due to different denervation methods. However, both unnatural decrease and increase in CDK5 expression can be related to some complications and diseases (17, 31). On the other hand, GSK-3β is an enzyme with the ability to do several tasks and involved in numerous cellular processes. Along with its metabolic role, GSK-3β is involved in maintenance and plasticity of skeletal muscle (15). Even GSK-3β has a role in regulation of apoptosis signaling (32). It has been shown that in pain receptors, GSK-3β has a role in morphine bearing and modulation of its pain relieving effects (13). In muscular tissue, GSK-3β has a key role in regulation of muscle atrophy (33, 34). Also it has been shown that inhibition of GSK-3β causes decrease in muscular atrophy (33) and in absence of GSK-3β, myofibrils are protected against atrophy (15). GSK-3β controls expression of atrogin-1 and MuRf1 (Muscle Ring Finger-1) due to effects of atrophy activators. Expression of atrogin-1 and MuRf1 in response to IGF-1 (Insulin-Like Growth Factor-1) or insulin, which are protein synthesis activators, decreases (35). Evenson et al. (2005) (33) reported that atrogin-1 and MuRf1 levels decrease by inhibiting GSK-3β drugs while in absence of GSK-3β, dexamethasone injection (which is an industrial glucocorticoid that its injection causes induction of proteolysis) modulates amount of myofibrillar atrophy. Activation of signaling cascades of phosphatidylinositol 3-kinase (PI-3K)/protein kinase B (Akt) is due to insulin or IGF-I effects (the main regulators of GSK-3β activity), which causes Akt activation/protein kinase B (PKB) directly through GSK-3β phosphorylation (36, 37). Akt blockage causes increase in GSK-3β activity and obvious increase in atrogin-1 and MuRf1 levels (35, 38). Phosphorylated-Akt activates (Mammalian Target of Rapamycin) mTOR 1 complex and inactivates GSK-3β simultaneously that leads to increase in mRNA transcription and protein synthesis capacity (39, 40). Akt decreases GSK-3β activity through phosphorylation and leads to increased expression of mRNA derived from eIF2B (Eukaryotic Translation Initiation Factor 2B) increased activity because of decreased inhibition of eIF2Bε through GSK-3β (41). This finding shows that GSK-3β activity is very essential in muscular atrophy initiation. GSK-3β has an important role in regulation of protein synthesis and muscular hypertrophy (42). Suppression of GSK-3β expression leads to trivial increases in contractile protein levels. However, acute decrease in GSK-3β of contractile proteins maintains proteolysis of contractile proteins more than excitation of protein synthesis. Initiation of protein transcription is apparently the time-limiting stage in muscular protein synthesis and controlled mainly by Eukaryote Initiation Factors (eIFs). Activated GSK-3β is responsible for eIF2Bε inhibition, which eventually causes decrease in the initiation of protein synthesis. On the other hand, inactivation of GSK-3β by upstream kinase of it, Akt, causes decrease of eIF2Bε phosphorylation and facilitation of transcription initiation of Mrna (41). It was shown that Akt is the critical point in signaling cascade of hypertrophy and atrophy (38). Akt was activated after activation of a series of intracellular signaling cascades like IGF-1 and PI3K (Phosphatidylinositol-4, 5-bisphosphate 3-kinase) (43). Downstream target of Akt is GSK-3β, which is phosphorylated and inactivated (44) and as a consequence, eIF2Bε would be exited from its inhibitive state (45). Akt may take part in muscular atrophy involvement processes; it is also probable that muscular atrophy will be followed by phosphorylated Akt reduction (46). In the present study, it was shown that decreased activity and tight ligation of the L5 spinal nerve in neuropathic pain cause decrease and increase in CDK5 and GSK-3β mRNA levels, respectively and these changes are followed by pain-related disorders and soleus muscle atrophy. Generally increase in GSK-3β may be related to muscular atrophy and decrease in protein synthesis, while decreases in Cdk5 expression is related to structural disorders and function of skeletal muscle. Thus, it is likely that increased activity in the form of strength and endurance training can contradict unnatural expression of these two proteins in this kind of neuropathic pain. Likewise, Lee et al. (2013) (47) showed that abovementioned types of training can lead to optimization of Cdk5 expression in brain. However, Leger et al. (2006) (46) reported increased activity in form of 8 weeks strength training causes muscular hypertrophy by increasing phosphorylated state of Akt, GSK-3β, mTOR proteins. However it needs more study to state it as a certain fact. The authors would like to thank Zohreh Mazaheri (Faculty of Medical Sciences, Tarbiat Modares University, Tehran, Iran) for her assistance in molecular analysis. Financial Disclosure: The authors declared that there was no conflict of interests with any financial organization regarding the material discussed in the manuscript.